I was a huge Roald Dahl fan as a kid, and still am. Whilst “Pure Imagination” spells it out, for me it was the sheer creative brilliance, the boundless detail of his imagination, and the humanity with which he realised his vision, via humour and relatable characters, that really conveyed a world where magic was a matter of fact. Where anything was possible. Charlie and the Chocolate Factory is a book filled with wonders, from the Oompa Loompas to the Great Glass Elevator. A river of chocolate! Fizzy lifting drink! Chocolate via TV! All enabled by none other than Willy Wonka, who I can only see as the author’s surrogate- leading you, the reader, through his magical, marvelous, chocolate factory. His other books achieved the same thing for me: The Witches, James and the Giant Peach, Matilda and, of course, Fantastic Mr Fox. They all share the themes of capturing the reader with a comical, down to earth tone, a relatable main character and then, of course, a truly magical, marvelous journey (not to mention getting one up on mean adults!). His books are filled with fantastical devices: witches with no toes, a fox with unsurpassed cunning or a lift that can go anywhere in space! All of this goes alongside his great characterisation that has created some truly hateable adversaries. Ms Trunchable, the Twits, the Witches, the Knids. His great skill at describing (in almost nonsensical adjectives) such original creations, made them seem so real, and in so doing, made the unbelievable seem entirely achieveable. Happy Roald Dahl Day Human Beans! Today is a day we look forward to every year without fail, as it gives us the perfect excuse to shout about one of our all-time favourite authors, Roald Dahl. And today marks 100 years of the wonderful man himself. What better way to celebrate than with an opportunity to win a phizz-whizzing prize? We’re on a mission to find out which Roald Dahl character is loved the most by our World of Books customers, so tell us who your favourite is and why – for your chance to win two tickets to the matinee performance Matilda the Musical on 3rd December 2016. Head over to our Facebook page and comment on our wall – or our competition post. Good luck to you all! We look forward to reading your gloriumptious entries. Please only enter if you’re able to attend on that day as tickets are not transferable. Also make sure you have a read of the fine print below. Please read these Terms and Conditions carefully prior to participating in World of Books Prize Draw (the “Prize Draw”). By participating in the Prize Draw each participant fully and unconditionally agrees to and accepts these Terms and Conditions. 1. Eligibility for Participation: The Contest is only open to individuals (referred to as “Participants”) Participants must be (i) a resident of the United Kingdom and (ii) over 18 years of age. Participants will only be entered into the contest once and are only allowed to win a prize of two tickets to see Matilda the Musical. World of Books employees and their immediate family are not permitted to enter the Prize Draw. 2. Access to Contest: The Participants enter the Contest by telling us, who their favourite Roald Dahl character is and why. Entries can be made on the World of Books Facebook (https://www.facebook.com/World-of-Books-182386701802396) Twitter (https://twitter.com/WorldofBooksltd – these entries must include @worldofbooksltd) and blog (http://blog.worldofbooks.com/) pages as well as emailed to competition@worldofbooks.com. A purchase or transaction is not required to participate or win. World of Books does not accept responsibility for network, computer, hardware or software failures of any kind, which may restrict or delay the sending or receipt of your entry. Entries must not be sent through agents or third parties. Late or incomplete entries will not be accepted. Any entries made by a person found to be using multiple Facebook/email accounts to enter the Prize Draws will be ineligible. Entries must be made by 23.59 GMT on 18/09/2016. 3. Winner is announced: Those selected to win the prize will be informed on 20/09/2016. Winners of all prizes will be notified via the channel they entered through. If the winner cannot be contacted within 48 hours of the terms of the notification, another entry will be selected and the original winner will forfeit any prize. 4. The Prize: 2 x tickets to see Matilda the Musical at the Cambridge Theatre in London on 3rd Dec ‘16. This prize cannot be transferred, exchanged and no cash alternative is available. The Prize is non-transferable, non-refundable and non-negotiable. The prize does not include travel or accommodation. There are no cash alternatives and the promoter’s decision is final. World of Books reserves the right to amend the prize or offer an alternative of equal or greater value. 5. Selecting winners: The winner will be selected at random by the World of Books Jury. The Jury’s decision is final and no correspondence will be entered into in relation to this decision. 6. Contest organizer: The Contest is organized by World of Books Ltd.
7. World of Books is not responsible for any lost, late, misdirected, stolen, illegible or incomplete entries. If, for any reason, the Prize Draw is not capable of running as planned, as a result of any causes beyond the control of World of Books which corrupt or affect the administration, security, fairness, integrity or proper conduct of the Prize Draw, World of Books reserves the right at its sole discretion to cancel, terminate, modify or suspend the Prize Draw and/or select winners from all eligible entries received prior to the cancellation. 8. World of Books reserves the right to (i) withdraw the competition (ii) cancel or change the promotion, (iii) cancel or refuse any individual’s entry and (iv) amend these terms and conditions at any time if circumstances make this necessary. 9. World of Books reserves the right at its sole discretion to disqualify any Participant it finds to be tampering with the entry process or the operation of the Prize Draw; to be acting in violation of these Terms and Conditions; or to be acting in an unsportsmanlike or disruptive manner, or with intent to annoy, abuse, threaten, or harass any other person or contestant. 10. World of Books is not responsible for any incorrect or inaccurate information, caused by any of the equipment or programming associated with or utilized in the Prize Draw or by any technical or human error which may occur in the processing of submissions in the Prize Draw. World of Books is not responsible for any injury or damage to any Participant or to any computer related to or resulting from participating or downloading materials in connection with this Prize Draw. 11. Copyright: Upon submission, contest entries become the property of World of Books and each Participant relinquishes any claims of ownership or rights therein upon submission of their entry into the Contest. Entries may be shared on the World of Books social and email channels as part of the competition. You might have noticed that recently we’ve been talking a lot about Roald Dahl. We’re big fans of him here at World of Books. And it just so happens that this year marks 100 years of Roald Dahl, so there’s no better time to honour one of our all-time favourite children’s book authors. Asking around the office of World of Books HQ, we’ve been collecting the best quotes from his books and we’ve compiled them here for your perusal. We can’t mention Roald Dahl quotes without referencing the wonderful Charlie and the Chocolate Factory. When the famous Willy Wonka opens his chocolate factory up for 5 lucky winners, no one would suspect that young Charlie Bucket – a poor boy who lives with his parents and grandparents in a small house on the outskirts of town, would discover the 5th and final golden ticket. One by one the other visitors are ejected from the factory until only Charlie remains to claim his prize. The story of The BFG follows a young girl named Sophie who lives in an orphanage under the watchful eye of mean old Mrs Clonkers. One night she wakes to find a large cloaked figure blowing something through an open window with a trumpet. This figure spots Sophie and carries her with him back to Giant Country. It is here that Sophie learns that the figure is in fact the Big Friendly Giant who uses his trumpet to blow dreams into the bedrooms of sleeping children. Together they embark on a plan to have the mean and evil giants captured and enlist the help of the Queen of England. Ah Matilda, a girl after our own hearts! A young girl who is treated horribly by her parents, uses her love of books to escape to faraway places. Soon her school teacher Miss Honey discovers how intelligent Matilda is and they become friends. After a prank on the frightening headteacher, Miss Trunchbull, goes wrong, Matilda learns that she has special powers of telekinesis. This opens up a world of adventures and opportunities for Matilda to get her own back on her parents and the mean old Trunchbull. The Twits are a spiteful couple who prank each other because they hate each other. They are both ugly characters as they have horrible thoughts which have made them look the way they do. They used to run a monkey circus and they have the monkeys living on their property. The monkeys aren’t treated very well at all and go on to make friends with a bird who helps them to turn the Twits house upside down. This forces the Twits to live on their heads which gives them the real shrinks. There are so many wonderful quotes to choose from that it was hard just to pick 5! 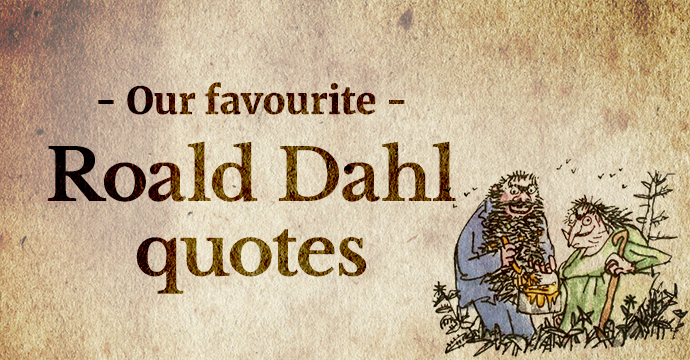 Do you have a favourite quote from a Roald Dahl book? Share it below and tell us why you chose it.